There is really no desktop space in the lab to let students color the ColAR sheet without having to move keyboards which is not convenient and in the past has lead to a few dropped keyboards with the younger grades. My students really want to be ON the computers when they’re in the lab especially the younger students. 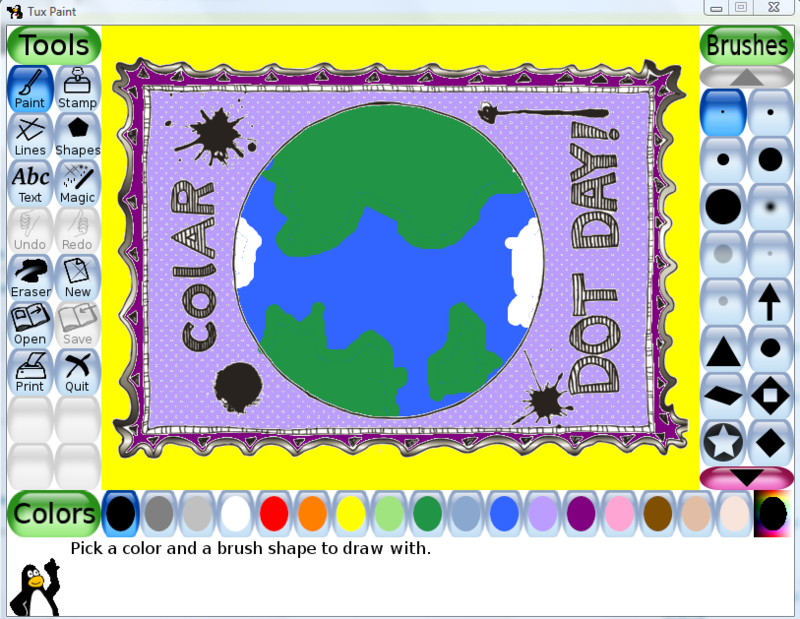 I have typically used Dot Day as an introduction to Tux Paint for my Kindergarten students. It’s a great introduction to using that program but the ColAR sheet is vertical and Tux Paint’s screen is horizontal. While I have the ColAR app installed on my iPad, I only have my iPad available in the lab for students to use. Not to be deterred, I decided to forge ahead with this for Kindergarten through 3rd Grade. I converted the PDF into an image so it could be used in Tux Paint and Paint.NET. The awesome thing about Tux Paint is that I can set all white areas to transparent in the PNG image I created and put this in the starter folder for Tux Paint and the students can’t color over or erase the outlines which is perfect for use with the ColAR app! The not so awesome thing about Tux Paint is that the image is sideways but my Kindergarten and 1st Grade students haven’t really minded. 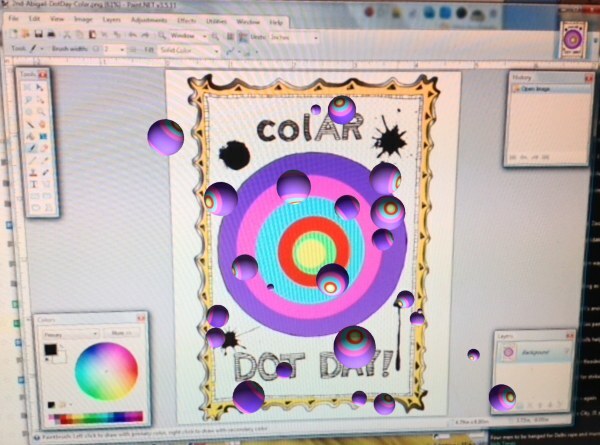 My 2nd & 3rd graders were introduced to Paint.NET for creating their ColAR dots. I didn’t introduce the layers features or anything complex. They are using the Fill Bucket, Paint Brush & Pencil and learning about Edit/Undo or undoing using the history window. The students were warned not to color over or erase the black outlines and they all have done really well with this so far. The one warning I didn’t make was not to fill the outside paper with black which one student did. It still works in the app but the app had a difficult time with this image. I try to be as green as possible in the Computer Lab which means almost no printing. Guess what? The ColAR app works pointed at the screen, too! I haven’t shown the the AR feature of the dots to the students yet. I can’t wait to see their reaction next week! 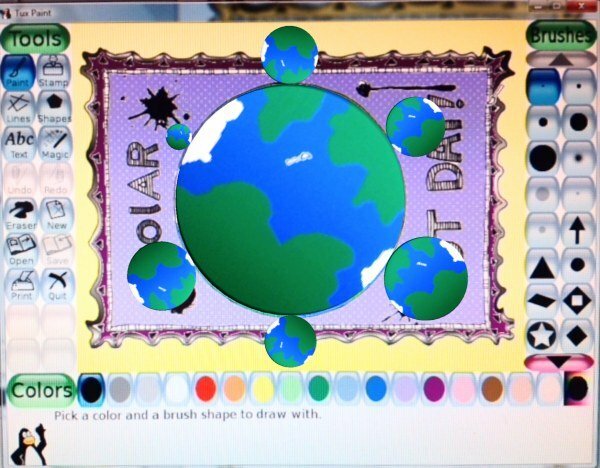 As part of our Dot Day celebrations, 4th-8th graders are doing an adaptation of Tricia Fuglestad’s Turn the Table on Tabloids lesson using Paint.NET to draw self-portraits and add the Newsweek magazine cover. I’m not leaving them out of the ColAR fun though. 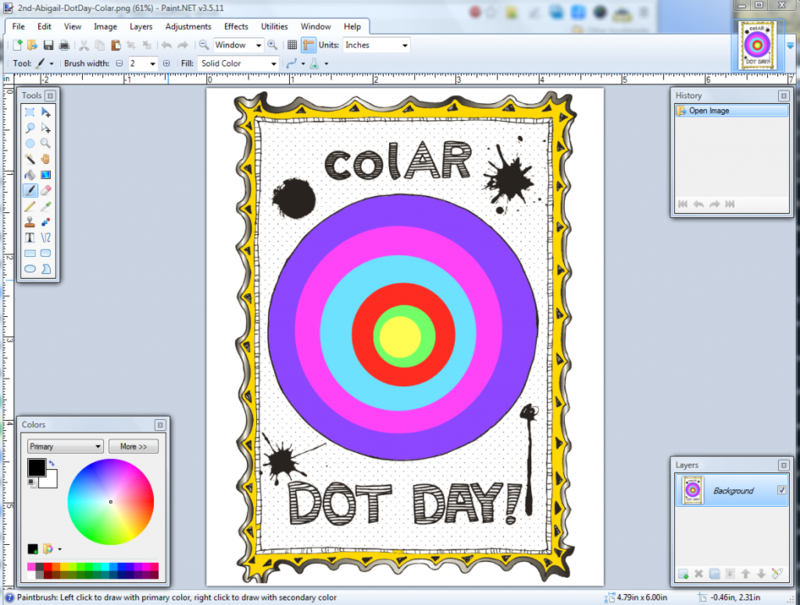 I am going to let them move their keyboards out of the way and color actual Dot Day ColAR sheets!